Earthquakes can either be low intensity earthquakes or high intensity earthquakes which might claim lives and cause damage to properties, hence the need to have your property retrofitted for earthquakes. A cripple wall is a wall that is less than a full story height and is usually placed between the first floor and the foundation because that is the weakest part of most old buildings. During an earthquake, the area between the foundation and the first floor is usually the first to collapse so by having a cripple wall in that area, you will drastically reduce the amount of damage done to a building during an earthquake. Foundation bolting is yet another method in which you can retrofit your property against earthquake damage. Foundation bolting is the process which prevents the up and down movements of your property during an earthquake as it might displace an unbolted property off it’s foundation. 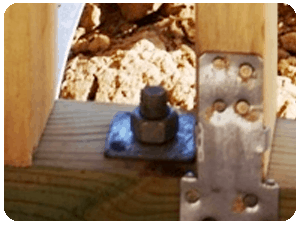 To bolt a building to it’s foundation, either expansion anchor bolts or sill plates are used. Expansion anchor bolts are used to directly attach the building to the foundation while the sill plates are used to attach the foundation and building on the sides if the space doesn’t allow direct bolting. Wood blocking is another way of strengthening your property against earthquakes without adding much to the cost of seismic retrofit. Wood blocking involves the addition of pieces of wood in between two studs in order to strengthen them. This is an easy method and yet it’s also very efficient in preventing the wooden studs from collapsing during an earthquake. Call California Foundation Works on 323-418-2239 to schedule a free seismic retrofit inspection and estimate. Whether of low or high magnitude, An earthquake will definitely put your building structure to the test. In areas such as Southern California that get to experience more than 10,000 earthquakes every year, homeowners are not only advised but some are required by law to retrofit their homes in order to avoid any damages to their properties or injuries. Earthquake retrofitting procedures are dependent on the property being retrofitted. If you are a homeowner in an area that is prone to earthquakes such as Southern California, You need to retrofit your home but even more so if your home is a soft story, was constructed before 1970 or has a crawlspace. Bracing the cripple wall which is also known as the pony wall is crucial to retrofitting your home against earthquakes because it is the weakest part of the house. Unbraced cripple walls are usually the first to crumble in the event of an earthquake. To brace cripple walls, structural-grade plywood shear panels are used to connect the wooden stands. Foundation bolting involves the attaching of a home’s wood frame to its concrete foundation. Houses will usually slide off of the foundation during an earthquake if they are not bolted or improperly bolted. Anchor bolts and metal plates are used bolt the wooden frame and the foundation together. Related : What is the risk? If the cripple wall has been braced and the house has been bolted to the foundation, the only other concern you should have in case of an earthquake is the house sliding off of the cripple wall because the floor of the house and cripple wall hasn’t been connected. Bolting the floor of the house to the cripple wall will ensure that it doesn’t slide off during an earthquake. If you live in an area that is prone to earthquakes or have a house that was built before 1970, has a crawlspace or is a soft story building call a professional earthquake retrofitting contractor. If you live in Los Angeles or the surrounding areas, Contact California Foundation Works for a free* earthquake retrofitting inspection. Despite the widespread use and familiarity of structural connectors, when not installed properly, they can become a source of headaches on job sites. As a field representative, I am often called to the jobsite to help resolve problems that arise when connectors are either installed incorrectly or used in unsuitable applications.Most of the time I get called because a building inspector has flagged a mistake or written a correction notice. These installation errors can impact the load capacity of connectors and create callbacks and long-term problems if not corrected. While there are other factors that can contribute to these problems, there are some common application and installation mistakes that easily can be avoided. Sill Bolt and Plate washer interference Typically only a standard cut washer and hex nut are needed to attach mudsills to anchor bolts. But in recent years, the codes have Studs, rim board and joists often have to be cut or notched to relieve interference, which can weaken framing members and add extra time and cost (see Left). Related : How will i know if i need retrofitting ? Fortunately the codes recognized this issue and now allow the washer to be slotted for adjustability (see Right). In light of recent events in Japan, Chile, and other parts of the world, devastating earthquakes causing unprecedented devastation, we here at California Foundation Works have been keeping those affected in our hearts and sending them our love and support. It has caused us to think about what we do, and to be grateful for the opportunity to make peoples homes safer. In California, we are about 50 years overdue for “a big one.” This means that there is a balance to the earth releasing tension. Every 100 years or so, aside from the usual smaller quakes and tremors, every major fault line must release tension in order to maintain the stability deep under the earth. Our major fault, the San Andreas Fault has not had a major quake in over 150 years. One hundred and fifty years! All we can say it that it is better to be prepared in advance, than to try and pick up the pieces after. Since the devastation in Japan, we have had a spiked increase in business. This shows us that people are acknowledging that there is a real threat, that this threat is close to home and that this threat will affect many of our lives and homes. This also shows us that people are only waking up and realizing that they need to think about solutions after the disaster has already happened. We have a special opportunity NOW to take precautions, before any unfortunate damage occurs. By bolting, bracing, installing new pier systems and drainage systems you can protect your home today from impending danger. It is your responsibility as a home owner to make sure your home is safe and that you took all the necessary steps to minimize the damage in case an earthquake will strike. Call us as soon as possible. We will come to your home, perform a free* foundation inspection and provide you with full detailed report of our findings and our recommendation for solutions. We will work with you, within your budget, within your time frame and comfortability. Looking forward to speaking with you soon to set up an appointment for your house bolting needs and start making your home a safer place!